Every genealogist should have a trip to Utah on their bucket list. My latest pilgrimage to Salt Lake City is in progress. 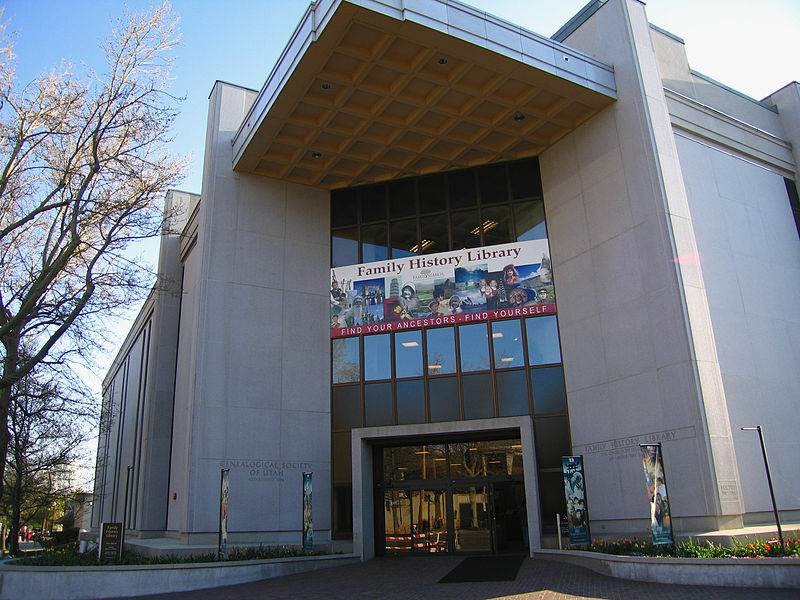 The Family History Library in SLC is the largest collection of genealogical material in the world. The FHL has remodeled their first floor to receive first time visitors into a Family Search computer room. Having prepared myself with a list of books to search, I headed directly to the U.S. Book collection on the third floor. There is also a help desk on the third floor with consultants available to help you achieve your U.S. research objectives. In addition, the basement floor 1 has International specialists available to assist with your research in foreign countries. As with any research trip, a genealogist should prepare by making a list of documents that you want to search. Start by identifying what you already know about your family with a timeline of events with dates and places where an ancestor resided. Then decide what countries, states and counties will be your focus. Perform a search of the FHL catalog using the state and then the county for example: Alabama, Randolph. I like to focus on the books rather than the microfilm because I can order microfilm from home and have it delivered to a local Family Search center. I recommend that you either bring a laptop or a mobile device to review ancestor profiles or you can print pedigree charts, family group sheets and individual timelines for reference. I bring my laptop and my mobile phone. I carry all of my materials in a back pack so I can pack up quickly if I need to leave my work table. I use my mobile phone to take pictures of the pages in the books. Do not forget your charger cords. The work tables and microfilm reader stations are equipped with AC outlets. We have stayed at a variety of hotels in Salt Lake City. There are dozens of hotels within walking distance of the FHL. The closest hotel is the Salt Lake Plaza which is very convenient. Lately we have been staying in Park City and driving into downtown SLC. We get a good rate on the off season timeshares in this ski town. It is a very scenic mountain drive on Interstate 80. We saw a couple of moose grazing on the hillside on our morning drive. I find it really hard to take breaks for creature comforts when I am at the FHL. There are so many wonderful resources at your fingertips, that it is hard to justify taking the time for a restaurant meal but there are plenty of restaurants within walking distance. PB&J is always a great plan with a bottle of water and a few snacks in the back pack. You cannot consume food or drink in the library with the exception of the snack room on the first floor. The vending machines are well equipped, with sandwiches, microwaveable foods, fruit, beverages and snacks. I recommend that you dress in layers with a light jacket or a sweater as it is easy to get chilled after hours of sedentary activity. If the weather is good, you can take a break outside or walk across to Temple Square and eat your lunch or your snacks. I have been known to take breaks on occasion but the thrill of the search usually keeps me inside. When you arrive on the third floor, ask the information desk about the binder guide to the U.S. Book collection. This binder has tabs for all U.S. states which list the row, section and library call number for each U.S. county and parish. For example, I was searching in Randolph County, Alabama. The binder told me that I could find the books about that county in Row 14, Section 365. All of the Randolph County books began with the call number 976.157. Armed with the row, section and call number you can zero in on the location of the genealogical gold! Sometimes I am selective and only pick the books that I have identified in advance. When I want to be more exhaustive in my search, I grab all of the books that I can carry from the shelf for my county of interest and take them to my table. I write down the title and the call number for each book on a legal pad. I review the index for my surnames of interest and make note of the pages that include my surname. I underline each page number as it is searched. I make note of any interesting finds and I take pictures of the title page of the book, the introduction and the explanation of how to use the book. I then take pictures of all of the pages that include references to my surnames of interest. I often copy additional pages in that section of the book to get the full context in which the ancestor was mentioned. 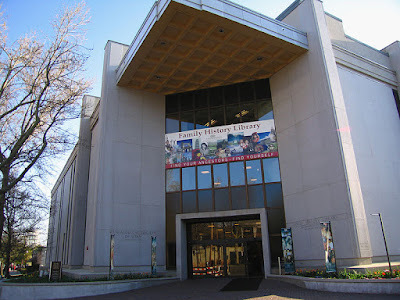 There is so much more to tell about a visit to the Family History Library in Salt Lake City. I will post more about my visit to Utah next week. Let me know if you have any questions about how to prepare for a visit and what to do once you get here. I am booked up with client work on this visit but let me know if you have any research requests for my next trip. You may notice that I am posting on a Sunday rather than my usual Monday. The explanation is that the Library is closed today but open from 8 AM to 5 PM on Monday. Tuesday through Thursday the FHL is open from 8 AM to 9 PM. We will see if I can make it that long on Tuesday!